Smoking cannabis has been around for a long time. It’s an age-old, tried-and-trusted method that probably originated soon after the caveman figured out he could make fire. In fact, after consuming some prehistoric bud, I wouldn’t be surprised if some mile-high caveman had the bright idea to invent the wheel (we’ve all had those strokes of “genius”, right?). He had to have some way to make his munchie runs, didn’t he? So if smoking has been around since forever, why does everyone keep asking me to what shatter vs wax is? Ingesting cannabis like food (oregano?) can be thought of as a relatively recent development because, well, the brownie wasn’t invented until the early 20th century (where else are you going to put your special ingredient?). All kidding aside, smoking and ingesting have been the primary means of cannabis consumption since the very beginning. Now, though, a new method of consumption is gaining in popularity: dabbing. 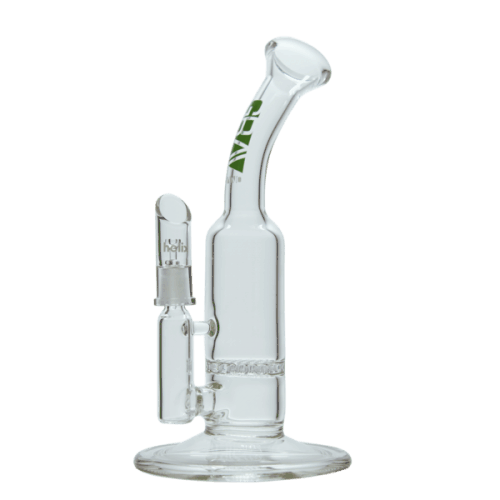 Dabbing is the process of heating butane hash oil or BHO (we’ll get to that in a minute) using a special rig (a bong equipped for the purpose) and then inhaling the resultant vapor. So yeah, you could say it’s kind of like smoking, but that would be like saying that a Boeing 747 is kind of like the Wright Brother’s first plane. Sure, they both fly but that’s where the similarities end. 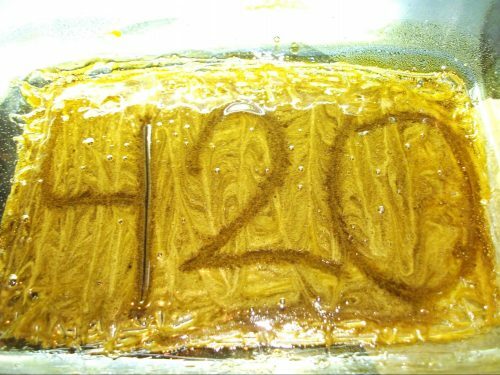 BHO is a cannabis concentrate (again, we’ll get to that in a minute) and can exhibit an average potency much higher than the herb you smoke–80% or more THC for concentrates compared to, on average, between 15 and 20% for herb. That’s a big difference! This extreme potency was the reason this new process was given the name dabbing…because just a dab’ll do ya. Now that we’ve talked about the process in general, we can get down to the specifics of the concentrates dabbing uses. We’ll talk about the most common concentrate, BHO, and get intimate with the two forms mentioned in the title: shatter and wax. The most common way to get the concentrates we’ve been speaking of is through butane extraction: forcing butane through cannabis plant material to extract the essential oils. 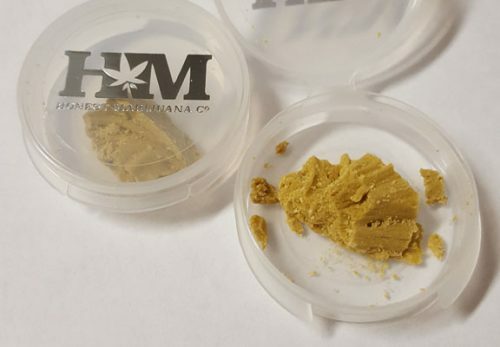 These oils, known as butane hash oil (BHO), are collected, the butane is allowed to evaporate, and you’re left with a highly concentrated substance that, when vaporized, results in what some call, an instant high. This high is also reported to be more powerful (much more powerful) and last longer than the conventional, herb-induced high. So BHO is the term we use to refer to ALL concentrates that have been produced through butane extraction–it’s the umbrella term for shatter vs wax vs everything else. Underneath that, then, are the different forms the concentrate can take. At the moment, our favorite concentrates are shatters and waxes. Shatter is a translucent–sometimes transparent–concentrate that looks an awful lot like rock candy or a Jolly Rancher. Just like other concentrates produced using Butane, it is produced by forcing butane through cannabis material to produce an amber liquid like the one shown below. 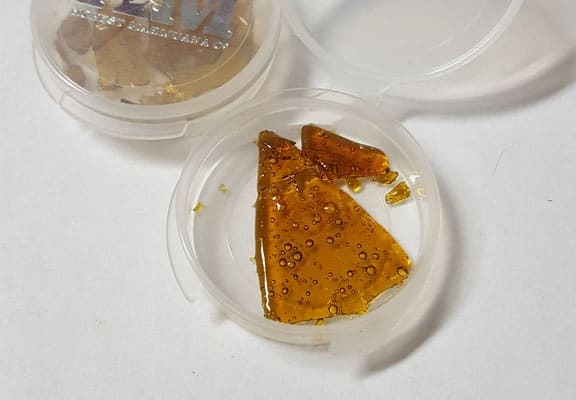 Shatter’s transparent quality results from the temperatures used during the extraction and finishing process (as well as other variables) and can only be described by some pretty heavy chemical jargon. To put it in simpler terms, think about the molecules in the BHO (that amber liquid) as Lego blocks. In shatter, they’re all stacked nice and neat, one on top of the other, like you had just built a wall. This molecular alignment allows light to pass through and gives the shatter it’s brittle format. Avoiding all the technical chemistry jargon, let’s go back to the Lego block analogy. While the Lego blocks in shatter are stacked neatly in rows (like a block wall), the Lego blocks in wax are a jumbled mess (like you’ve just dumped them out into a pile). Because the Lego blocks are going every which way and have no semblance of organization, wax is opaque and has that coconut oil consistency. Granted, both of these descriptions are overly-simplified–I certainly wouldn’t use them on my chemistry test–but they can help you visualize what’s going on at the molecular level. So What’s The Difference Between Shatter vs Wax? Nothing really. Both shatter and wax are BHO concentrates that have roughly the same THC potency. They’re both used in dabbing. And they both provide a more powerful, longer-lasting high. The only real difference is in their appearance. The best way to answer the shatter vs wax question is to try them both for yourself. I mean, really, how can you go wrong? It’s cannabis after all. Plus you can use it as an excuse to “consume” more of your favorite strains (we can’t even say smoke now, can we). Call it a science experiment. “Leave me alone, Ma! I’m doing science…by the way, do we have any Twinkies?” I wonder if you could get a grant for something like that (without the Twinkies, of course)?